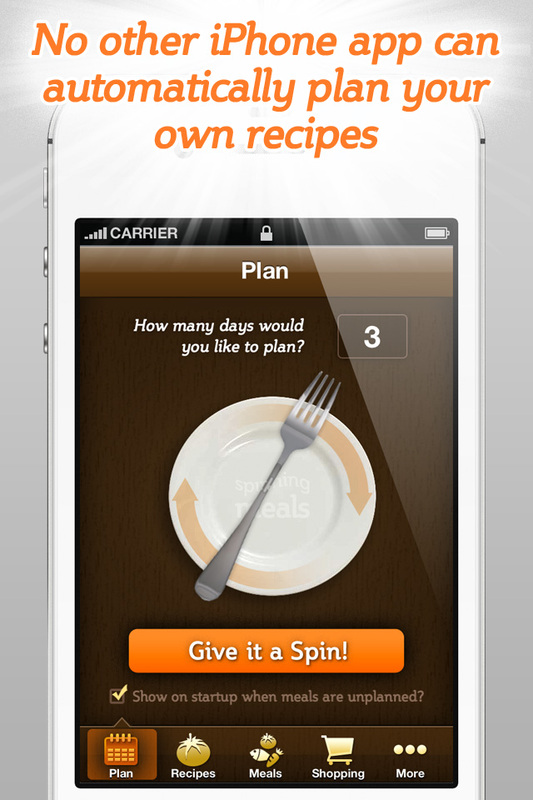 Spinning Meals is the only iPhone app that automatically plans your weekly meal schedule for you, based on your own recipes and preferences. 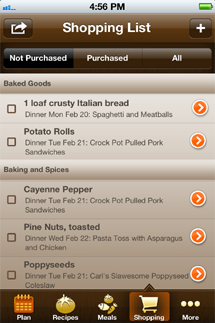 A single tap will generate a plan and shopping list to ensure you have all the ingredients needed for tasty, nutritious meals for the whole family. Introducing a game-changer for the family table. Existing users: please see urgent and important info on transferring your recipes to a new phone or tablet. 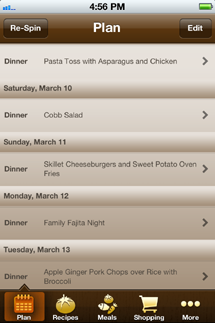 As seen in the New York Times, and featured in eHow’s 12 Great Apps For Moms, Spinning Meals is the only iPhone app that automatically plans your weekly meal schedule for you, based on your own recipes and preferences! Create an entire week’s meal plan with a simple tap, and the app will automatically generate a shopping list for you to ensure you have all the ingredients necessary to make tasty, nutritious meals for the whole family. Using a patent-pending planning engine, Spinning Meals considers your food preferences and the seasonal variations which go along with your family’s favorite meals. 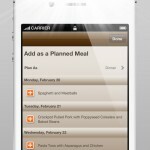 Customize each recipe in your queue so the “spinner” will know how often you wish each dish to appear on your meal plans. 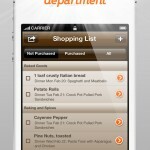 Give the app a spin and “Voilà!” Your grocery list and meal schedule is all ready to go. 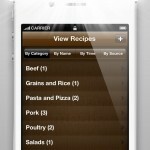 This genius app takes the tedium out of menu planning. 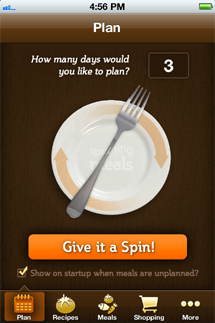 With a single spin, you get a weekly menu and a shopping list that makes it easy to pull off. 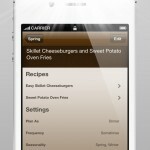 It’s also simple to customize and add your family’s favorite dishes to the rotation. I’m very impressed with this app, top to bottom. 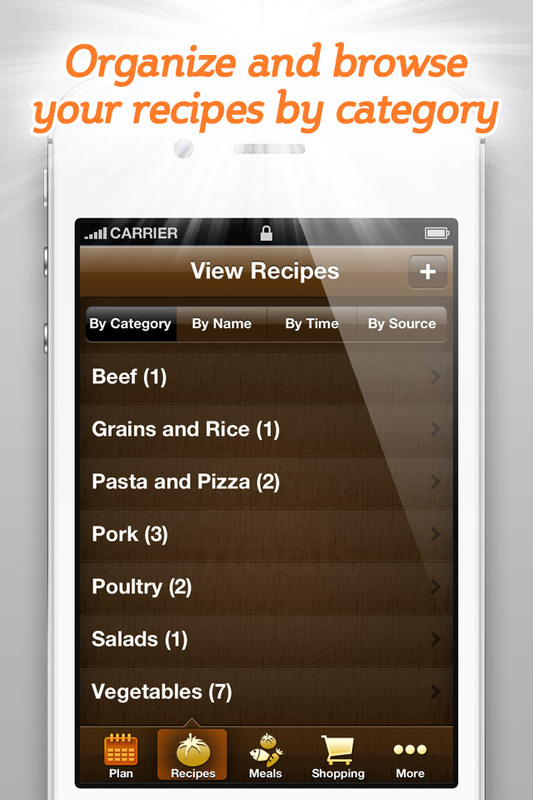 It solves the problem of the dinner rut, lets you use your own recipes while also adding in fresh ideas and it gives you automatic grocery lists. An all around win, win, win for me. Stay tuned for exciting new updates coming soon! Hi, I’m Ryan Smith, a family cooking blogger and the creator of the Spinning Meals app. 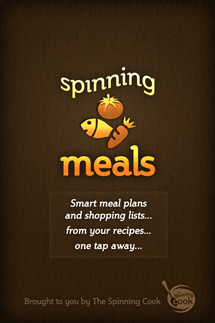 The big idea behind Spinning Meals is that in a single tap, it generates your meal plan and shopping list, based on your favorite recipes, and the schedule and preferences you set. 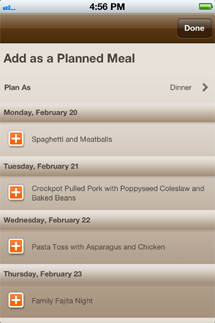 Some recipes are provided, and you can enter your own, organizing by category and prep time, which are used by the app to plan faster meals on certain days to fit your schedule. Entering ingredients and instructions can be very simple for a recipe you already know, just give it a title and put in the few key ingredients you’ll need to purchase. Under Meals, you group recipes together and assign a season and frequency, for instance apple-ginger glazed pork chops with pan-seared broccoli and yams is a meal we eat often, in the winter. 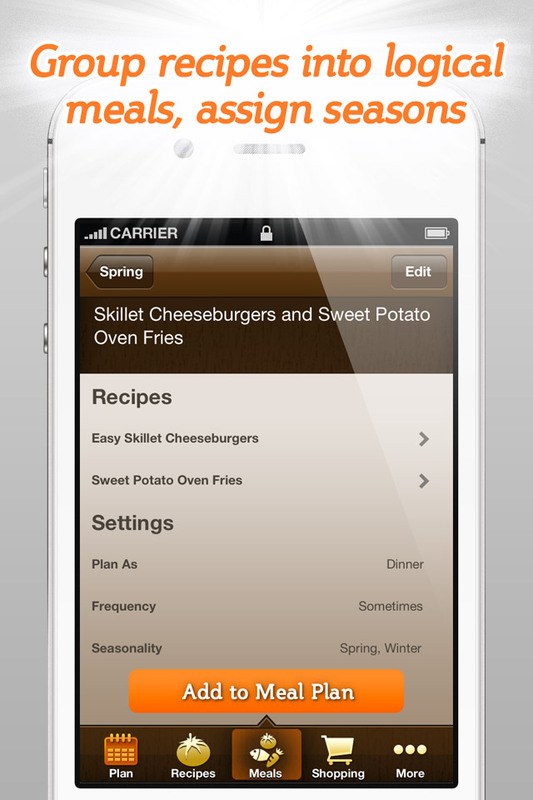 The app then generates a smart meal plan for the current season. Match the app to your schedule in Spin Settings, where you can turn meal planning off and on for Breakfast, Lunch, and Dinner each day, or choose a set meal for a day of the week, maybe Pizza Night every Thursday. 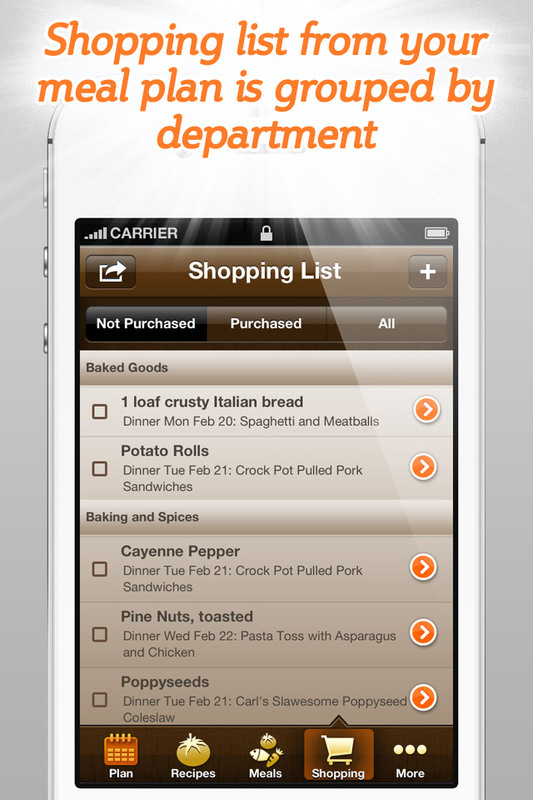 With this the app creates a Meal Plan that suits your schedule and the seasons of the year, with a shopping list organized by department. 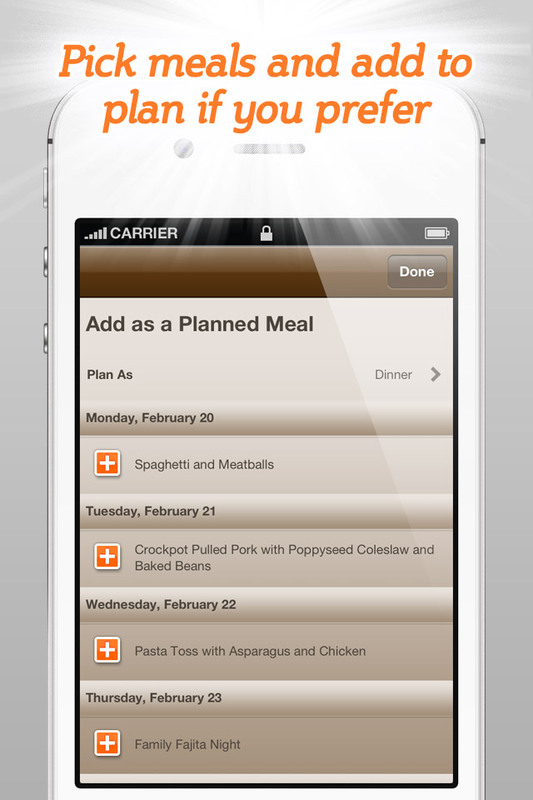 You can adjust the plan manually and also add recipes one at a time if you prefer. With your shopping list you can add other items easily, including recurring items that you always consider buying at every shopping trip, like milk or eggs. Let’s face it, healthy eating is hard to master. Give yourself an advantage you’ll be thankful for week after week after week. I am passionate about families continuing to cook at home and eat together. We want to hear your feedback, and make this app a real game-changer for your family and your health. 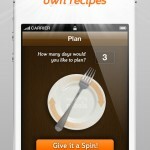 Please also join in the conversation at our family cooking blog which is SpinningCook.com. To your health! We love your feedback and will promptly respond!